Send to an object instance. Send to the superclass instance of the current class. Send to the superclass of the current class. 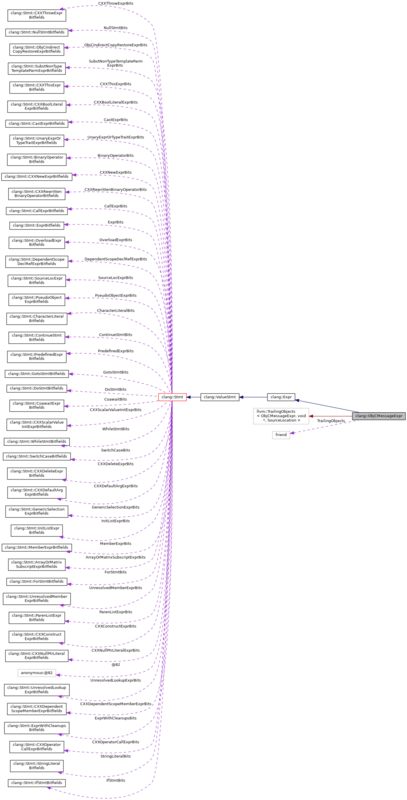 The "void *" trailing objects are actually ONE void * (the receiver pointer), and NumArgs Expr *. But due to the implementation of children(), these must be together contiguously. Definition at line 950 of file ExprObjC.h. Definition at line 1460 of file ExprObjC.h. Definition at line 1461 of file ExprObjC.h. The kind of receiver this message is sending to. The receiver is a class. The receiver is an object instance. The receiver is a superclass. The receiver is the instance of the superclass object. Definition at line 1096 of file ExprObjC.h. Definition at line 1471 of file ExprObjC.h. Definition at line 1477 of file ExprObjC.h. Definition at line 1473 of file ExprObjC.h. Definition at line 1481 of file ExprObjC.h. Definition at line 1463 of file ExprObjC.h. Definition at line 1467 of file ExprObjC.h. Definition at line 370 of file ExprObjC.cpp. Definition at line 380 of file ExprObjC.cpp. Definition at line 1485 of file ExprObjC.h. Create a message send to super. Context The ASTContext in which this expression will be created. T The result type of this message. VK The value kind of this message. A message returning a l-value or r-value reference will be an l-value or x-value, respectively. LBracLoc The location of the open square bracket '['. SuperLoc The location of the "super" keyword. IsInstanceSuper Whether this is an instance "super" message (otherwise, it's a class "super" message). Sel The selector used to determine which method gets called. Method The Objective-C method against which this message send was type-checked. May be nullptr. Args The message send arguments. RBracLoc The location of the closing square bracket ']'. Definition at line 206 of file ExprObjC.cpp. Create a class message send. Receiver The type of the receiver, including source-location information. Definition at line 226 of file ExprObjC.cpp. Create an instance message send. Receiver The expression used to produce the object that will receive this message. Definition at line 245 of file ExprObjC.cpp. Create an empty Objective-C message expression, to be filled in by subsequent calls. Context The context in which the message send will be created. NumArgs The number of message arguments, not including the receiver. Definition at line 263 of file ExprObjC.cpp. Definition at line 1395 of file ExprObjC.h. Referenced by clang::Sema::checkRetainCycles(), doRewriteToUTF8StringBoxedExpressionHelper(), getExpressionTraitName(), getNSArrayObjects(), GetNSSetArgumentIndex(), getReturnTypeForMethod(), LookupMethodInReceiverType(), clang::edit::rewriteObjCRedundantCallWithLiteral(), rewriteToArrayLiteral(), rewriteToArraySubscriptSet(), rewriteToDictionaryLiteral(), rewriteToDictionarySubscriptSet(), rewriteToNumberLiteral(), rewriteToNumericBoxedExpression(), rewriteToStringBoxedExpression(), rewriteToSubscriptGetCommon(), and shouldNotRewriteImmediateMessageArgs(). Definition at line 1399 of file ExprObjC.h. Retrieve the arguments to this message, not including the receiver. Definition at line 1386 of file ExprObjC.h. Definition at line 1389 of file ExprObjC.h. Definition at line 1452 of file ExprObjC.h. the return type of the message being sent. This is not always the type of the message expression itself because of references (the expression would not have a reference type). It is also not always the declared return type of the method because of instancetype (in that case it's an expression type). Definition at line 296 of file ExprObjC.cpp. References clang::ASTContext::getLValueReferenceType(), clang::ASTContext::getObjCInstanceType(), clang::ASTContext::getRValueReferenceType(), clang::Expr::getType(), clang::Expr::getValueKind(), clang::VK_LValue, clang::VK_RValue, and clang::VK_XValue. Returns the type of a class message send, or NULL if the message is not a class message. Definition at line 1279 of file ExprObjC.h. Referenced by clang::CodeGen::CodeGenFunction::EmitObjCMessageExpr(), getExpressionTraitName(), getReturnTypeForMethod(), maybeAdjustInterfaceForSubscriptingCheck(), recordFixedType(), and clang::TextNodeDumper::VisitObjCMessageExpr(). Returns a type-source information of a class message send, or nullptr if the message is not a class message. Definition at line 1288 of file ExprObjC.h. Definition at line 1453 of file ExprObjC.h. Returns the object expression (receiver) for an instance message, or null for a message that is not an instance message. Definition at line 1260 of file ExprObjC.h. Referenced by clang::arcmt::ObjCMigrateAction::BeginInvocation(), canRewriteToSubscriptSyntax(), checkForLiteralCreation(), clang::Sema::checkRetainCycles(), describeUninitializedArgumentInCall(), clang::CodeGen::CodeGenFunction::EmitObjCMessageExpr(), getExpressionTraitName(), GetNSSetArgumentIndex(), getReceiverNullability(), clang::ObjCMethodCall::getRuntimeDefinition(), clang::arcmt::trans::hasSideEffects(), isCallToSelfClass(), recordFixedType(), clang::sema::FunctionScopeInfo::recordUseOfWeak(), rewriteToArraySubscriptSet(), rewriteToDictionarySubscriptSet(), rewriteToSubscriptGetCommon(), shouldExtendReceiverForInnerPointerMessage(), and tryEmitSpecializedAllocInit(). Definition at line 1266 of file ExprObjC.h. Definition at line 1416 of file ExprObjC.h. Definition at line 1356 of file ExprObjC.h. Referenced by clang::arcmt::ObjCMigrateAction::BeginInvocation(), checkForLiteralCreation(), clang::Sema::checkRetainCycles(), DecodeOperatorCall(), clang::CodeGen::CodeGenFunction::EmitObjCMessageExpr(), clang::CodeGen::CodeGenFunction::EmitObjCMessageExprLValue(), clang::Sema::EmitRelatedResultTypeNote(), findMethodDecl(), clang::ObjCMethodCall::getRuntimeDefinition(), IsReadonlyMessage(), clang::Expr::isUnusedResultAWarning(), and clang::edit::rewriteToObjCSubscriptSyntax(). Definition at line 1363 of file ExprObjC.h. Definition at line 1375 of file ExprObjC.h. Referenced by AuditedType(), clang::arcmt::trans::hasSideEffects(), and clang::Expr::isUnusedResultAWarning(). Return the number of actual arguments in this message, not counting the receiver. Definition at line 1382 of file ExprObjC.h. Referenced by clang::arcmt::ObjCMigrateAction::BeginInvocation(), clang::Sema::checkRetainCycles(), getExpressionTraitName(), getNSArrayObjects(), clang::sema::FunctionScopeInfo::recordUseOfWeak(), clang::edit::rewriteObjCRedundantCallWithLiteral(), rewriteToArrayLiteral(), rewriteToArraySubscriptSet(), rewriteToDictionaryLiteral(), rewriteToDictionarySubscriptSet(), rewriteToNumberLiteral(), rewriteToNumericBoxedExpression(), clang::edit::rewriteToObjCSubscriptSyntax(), rewriteToStringBoxedExpression(), rewriteToSubscriptGetCommon(), and shouldNotRewriteImmediateMessageArgs(). Definition at line 1438 of file ExprObjC.h. Retrieve the Objective-C interface to which this message is being directed, if known. 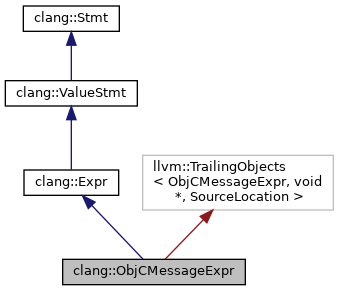 This routine cross-cuts all of the different kinds of message sends to determine what the underlying (statically known) type of the receiver will be; use getReceiverKind() to determine whether the message is a class or an instance method, whether it is a send to super or not, etc. The Objective-C interface if known, otherwise nullptr. Definition at line 358 of file ExprObjC.cpp. Referenced by checkForLiteralCreation(), getMethodReceiverIfKnownImmutable(), GetNSMutableArrayArgumentIndex(), GetNSMutableDictionaryArgumentIndex(), GetNSSetArgumentIndex(), and clang::ObjCMethodCall::getRuntimeDefinition(). Determine the kind of receiver that this message is being sent to. Definition at line 1234 of file ExprObjC.h. Referenced by AuditedType(), clang::arcmt::ObjCMigrateAction::BeginInvocation(), checkForLiteralCreation(), clang::Sema::checkRetainCycles(), clang::CodeGen::CodeGenFunction::EmitObjCMessageExpr(), findMethodDecl(), getExpressionTraitName(), GetNSSetArgumentIndex(), getReturnTypeForMethod(), clang::arcmt::trans::hasSideEffects(), maybeAdjustInterfaceForSubscriptingCheck(), recordFixedType(), clang::edit::rewriteToObjCSubscriptSyntax(), shouldExtendReceiverForInnerPointerMessage(), tryEmitSpecializedAllocInit(), and clang::TextNodeDumper::VisitObjCMessageExpr(). Source range of the receiver. Definition at line 321 of file ExprObjC.cpp. Retrieve the receiver type to which this message is being directed. The type of the receiver. Definition at line 344 of file ExprObjC.cpp. Definition at line 1417 of file ExprObjC.h. Definition at line 337 of file ExprObjC.cpp. Referenced by clang::Sema::checkRetainCycles(), DecodeOperatorCall(), describeUninitializedArgumentInCall(), clang::CodeGen::CodeGenFunction::EmitObjCMessageExpr(), findMethodDecl(), getExpressionTraitName(), getNSArrayObjects(), GetNSMutableArrayArgumentIndex(), GetNSMutableDictionaryArgumentIndex(), GetNSSetArgumentIndex(), getReturnTypeForMethod(), clang::ObjCMethodCall::getRuntimeDefinition(), isCallToSelfClass(), clang::edit::rewriteObjCRedundantCallWithLiteral(), rewriteToArrayLiteral(), rewriteToBoolLiteral(), rewriteToCharLiteral(), rewriteToDictionaryLiteral(), rewriteToNumberLiteral(), rewriteToNumericBoxedExpression(), clang::edit::rewriteToObjCSubscriptSyntax(), rewriteToStringBoxedExpression(), shouldNotRewriteImmediateMessageArgs(), tryEmitSpecializedAllocInit(), and clang::TextNodeDumper::VisitObjCMessageExpr(). Definition at line 1425 of file ExprObjC.h. Definition at line 289 of file ExprObjC.cpp. Definition at line 1419 of file ExprObjC.h. Retrieve the location of the 'super' keyword for a class or instance message to 'super', otherwise an invalid source location. Definition at line 1301 of file ExprObjC.h. Referenced by clang::arcmt::ObjCMigrateAction::BeginInvocation(), and clang::Sema::checkRetainCycles(). Retrieve the type referred to by 'super'. Definition at line 1336 of file ExprObjC.h. Referenced by clang::CodeGen::CodeGenFunction::EmitObjCMessageExpr(), clang::ObjCMethodCall::getRuntimeDefinition(), maybeAdjustInterfaceForSubscriptingCheck(), and recordFixedType(). Determine whether this is an class message to either a specified class or to super. Definition at line 1254 of file ExprObjC.h. isDelegateInitCall - Answers whether this message send has been tagged as a "delegate init call", i.e. a call to a method in the -init family on self from within an -init method implementation. Definition at line 1413 of file ExprObjC.h. Indicates whether the message send was implicitly generated by the implementation. If false, it was written explicitly in the source code. Definition at line 1230 of file ExprObjC.h. Referenced by clang::arcmt::ObjCMigrateAction::BeginInvocation(), checkForLiteralCreation(), and clang::edit::rewriteToObjCSubscriptSyntax(). Determine whether this is an instance message to either a computed object or to super. Definition at line 1248 of file ExprObjC.h. Referenced by clang::Sema::checkRetainCycles(), GetNSSetArgumentIndex(), clang::ObjCMethodCall::getRuntimeDefinition(), and clang::Expr::isUnusedResultAWarning(). setArg - Set the specified argument. Definition at line 1405 of file ExprObjC.h. Definition at line 1294 of file ExprObjC.h. Definition at line 1414 of file ExprObjC.h. Turn this message send into an instance message that computes the receiver object with the given expression. Definition at line 1272 of file ExprObjC.h. Definition at line 1370 of file ExprObjC.h. Definition at line 1351 of file ExprObjC.h. Definition at line 1447 of file ExprObjC.h. Definition at line 1343 of file ExprObjC.h. Definition at line 1091 of file ExprObjC.h. Definition at line 1092 of file ExprObjC.h. Definition at line 1093 of file ExprObjC.h.